Halfway between Regina and Saskatoon, open fields of moist mixed grassland are hard to spot. Section upon section of golden and greening crops are a peripheral blur while remnant grasses border dugouts and ponds close to the road. Many red-winged blackbirds fly across the space from grass to grass, while other birds I do not know calmly walk across the grid road before gravel dust blinds them. In the southwest grass was everywhere and you had to know where you were going to find people. Here, farms are everywhere and you must know where you’re going to find grass. 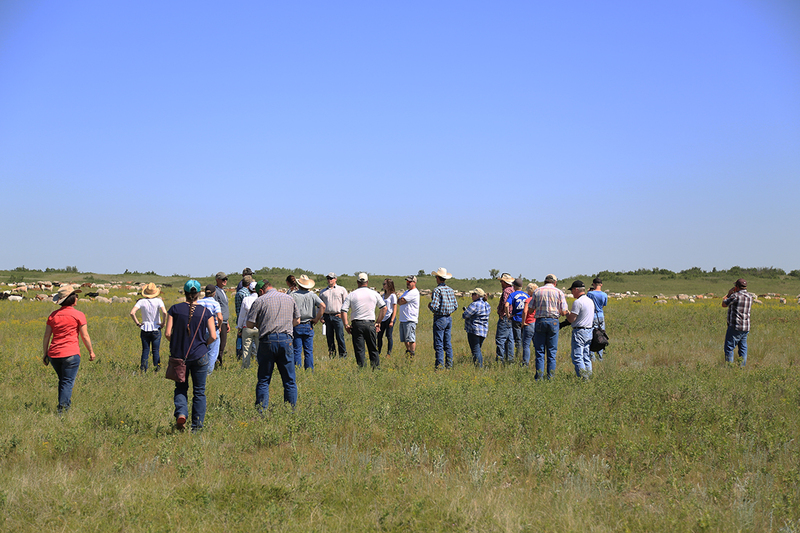 The morning sun is already hot as a group of about 25 people gather at Barney’s Corrals, just 30 kilometres southwest of Girvin, Saskatchewan, for the annual Wilner-Elbow community pasture tour. After the last stragglers arrive, one of the pasture’s board members asks everyone to introduce themselves. We form a circle by the parked cars and it quickly becomes clear that this is a diverse group: there are university researchers, journalists, representatives from Nature Conservancy Canada and the South Saskatchewan River Watershed Stewards Inc., a forage 4H club, employees with the provincial Ministry of Agriculture, an Enbridge company rep, a team of spray applicators, several of the pasture’s board members and the pasture manager. Soon everyone disperses into different trucks. The purpose of the morning is to see how the pasture is fairing under the board’s weed management program, a behemoth the pasture patrons learned they would inherit when the federal government shut down the PFRA Community Pasture Program in 2012. 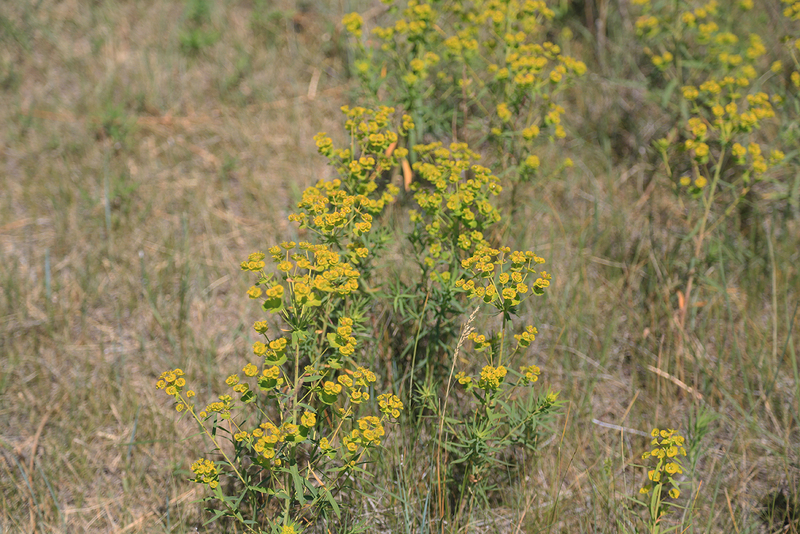 Currently, around 11,000 acres of leafy spurge, a noxious weed, invades the 40,000-acre pasture. On the way to the pasture, I pile into Ian McCreary’s white truck with a land agrologist and leasing and sales manager from the Ministry of Agriculture. McCreary is a board member and has been instrumental in Wilner-Elbow’s transition. On the road, McCreary says he is grateful the government reps have come but he doesn’t hesitate to acknowledge that this journey has been a frustrating one from the start. Just as the spurge’s yellow flowers begin to roll past as we enter the pasture, McCreary introduces me to my fellow passengers explaining that I’m reporting on the grasslands and the successes and failures of the PF pasture transition. The lands sales manager is quick to stress that there haven’t been failures. “I think Sask Ag needs to open their eyes if they don’t think there’s been any failures,” McCreary responds in a flash. 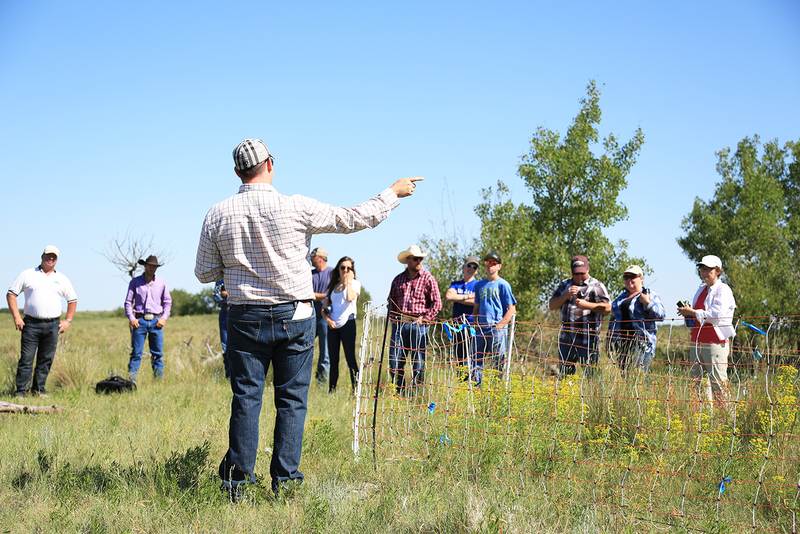 Ian McCreary, fourth from right, talks to people at the 2018 Wilner-Elbow pasture tour. Credit: Katie Doke Sawatzky. Minister Stewart’s response to the divestment was to put together a five-person advisory committee consisting mainly of industry representation, not pasture patrons. Two members were from the Stock Growers Association, two were from the Saskatchewan Cattlemen’s Association and the last was the president of Saskatchewan Association of Rural Municipalities. Their first reaction to the divestment announcement in 2012 was to sell the pastures to the patrons. “They took their advice from everybody except pasture patrons,” said McCreary. “There was absolutely no consultation by that administration in any ideas of how to do this or how to potentially do it well and so there was a lot of scrambling, of course lots of rumours, lots of blind alleys,” said McCreary. While Stewart repeated the mantra that producers are the best stewards of the province’s grasslands during the brief media storm over the divestment, he didn’t take into account that some of the PF pasture patrons were mixed farmers like McCreary, not ranchers who already had the knowledge and skill-set to manage their own grass well. The initial decision to sell the pastures to the patrons, in McCreary’s words, was untenable because of the infrastructure costs. “I think there’s a tremendous number of players and stockgrowers and others who wanted this system to fail…they were pretty open to the fact that they wanted access to that land,” said McCreary. “Saskatchewan got bad advice but they went ahead anyway,” he said. There wasn’t a lack of alternative models proposed for the PF pastures, either. Roland Crowe, then Chief of the Federation of Sovereign Indigenous Nations and former PFRA director Carl Neggers unsuccessfully proposed the First Nations Sustainable Land Management Joint Venture. 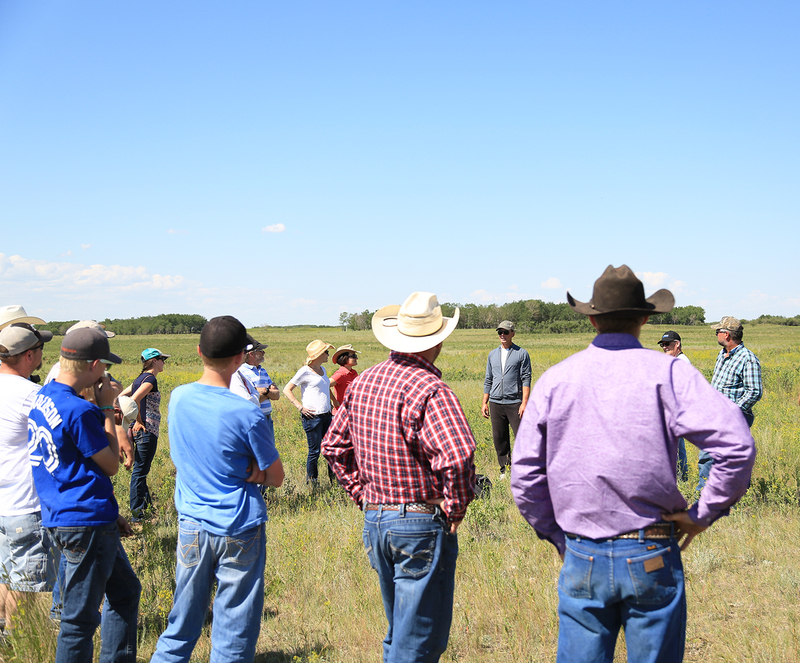 The joint venture was to have been guided by a multi-stakeholder board of First Nations, cattle and bison producers, government officials and environmentalists to manage the 62 pastures. In another Leader-Post article, it was reported that Crowe saw potential for the land to go through the Treaty Land Entitlement process, which he negotiated in 1992. Under the TLE, Crown lands that become available are returned to First Nations who still haven’t received all of the land allotted to them when the treaties were signed. Ashton said the provincial government didn’t take the venture seriously because FSIN didn’t have expertise in land management, but this seemed beside the point for the organization. “In all instances, the provincial government failed to consult and accommodate the TLE First Nations on these program and policy changes,” wrote Brad Michael, a research and policy analyst for FSIN’s Lands and Resources Secretariat. The comment again showed little understanding of the role of PF pasture patrons. Besides being on boards that decided allotment numbers, the patrons didn’t have any control over the management of the pastures. They used them but did not maintain them. Federally employed pasture managers oversaw the grazing, breeding and ecological monitoring of those lands, while patrons tended to their own agricultural operations during the summer months. The province’s view of these pasture lands also overlooked their significant public benefits. A 2008 study by Suren Kulshreshtha, an agricultural economist associated with the University of Saskatchewan’s School of Environment and Sustainability, calculated the distribution of private and public benefits of the PFRA pastures. 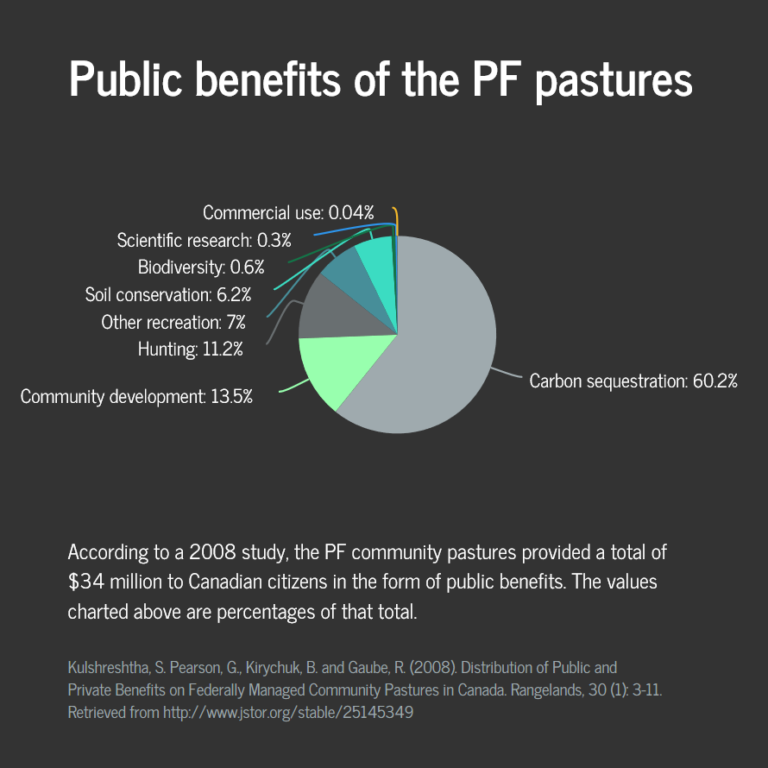 Out of 24 total benefits provided by the PFRA community pastures, the study found 10 public benefits outside of the private benefits of grazing and breeding services for patrons, and valued them at $34 million a year. On-average, 17 per cent of the $22 million program was spent on public benefits and with total society benefits counted at $55 million, there was a 2.5 ratio of annual benefits to costs. Ian McCreary’s family has farmed near Bladworth, Saskatchewan, for three generations. They’ve also been Wilner-Elbow pasture patrons since the PFRA program began in the 30s. As a mixed farmer, 30 per cent of McCreary’s operation is livestock and he’s always used the pastures for summer grazing. “I firmly believe that…the mixed operation is the most sustainable in terms of both the carbon footprint and nutrient cycling,” he said. McCreary wasn’t unfamiliar with the Harper government’s radical actions. He was on the board of directors for the Canadian Wheat Board, which died a tortuous death during the Conservatives’ time in office. The 2012 cut of the PFRA seemed par for the course, but that didn’t make the loss of the pastures any less frustrating. The patrons now had to legally incorporate to lease the pastures as private grazing operations. It seems straightforward, but it’s not. Often, the PF pasture patrons weren’t neighbours. Some travelled a fair distance to drop their cattle off at community pastures in the summer and didn’t necessarily know each other. Despite the obstacles and uncertainty, McCreary got cracking. The first hurdle: the government wouldn’t give him contact information for pasture patrons. Using GPS coordinates and with the help of the Agricultural Producers Association of he managed to gather 60 representatives from the 62 community pastures in Saskatoon, in January, 2013. The group formed the Community Pasture Patrons Association of Saskatchewan, which is now the only organization in the province that advocates for patrons of the former PF pastures. Although to date, not one pasture has been sold to the patrons, due to their struggles to mobilize and incorporate, they continually feel the strain of the new pressures that have been placed on their shoulders. For Saskatchewan’s eastern neighbour, it’s a different story. Manitoba only had 24 PF pastures and therefore a much smaller headache to deal with during the divestment. Barry Ross is the general manager of the Association of Manitoba Community Pastures, a non-profit organization with 45 employees based out of Minnedosa. Before the transition he was land manager for the PF’s Brandon District, and witnessed how the Manitoba government responded to the divestment. The transition was handled quite differently than in Saskatchewan. Ross described a meeting in June 2012 at which the Manitoba Beef Producers gathered the pasture chairmen and reps from the provincial and federal governments together in Winnipeg. “Early on in the process, they decided it would be … (modelled) after the PFRA grassroot system,” said Ross, explaining that each pasture has a grazing association chairman and that a patron-run board helps direct the organization. In 2012, Manitoba Crown Lands hired Ross to work on the pasture file and then seconded him to the pasture association AMCP. The government provided him and other staff members with work space in Minnedosa. In meetings with the province, Ross argued that because cattle numbers were sometimes low in the pastures, having each pasture fend for itself might be unviable compared to retaining a provincial umbrella organization. The province agreed to a three-year pilot project and the fledgling organization asked Ottawa to transfer the remaining pastures sooner since the lands would be under one business plan. The Association of Manitoba Community Pastures incorporated in 2014 and the last pastures were reverted to the province in 2016 rather than 2018. The province’s lease is with AMCP alone, not individual patrons, and the organization provides third-party oversight similar to the PFRA system. Although they nixed the breeding program and lost some patrons in the first year of the transition when things were uncertain, AMCP is now responsible for 20 pastures that serve 350 patrons, which according to Ross is “pretty close” to what numbers were under the PFRA. 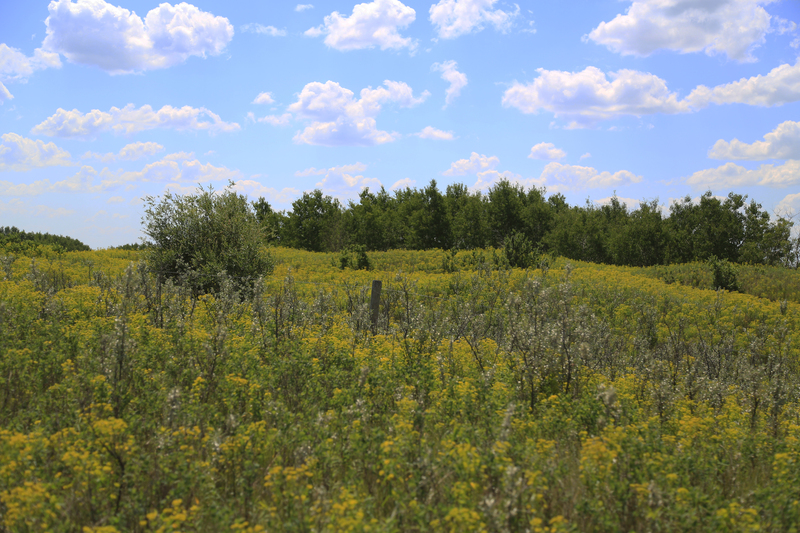 To cement justification for the long-term lease that the provincial government would give AMCP after the pilot period ended, Ross asked the Winnipeg-based Institute for Sustainable Development to quantify the ecological goods and services of the community pastures under AMCP’s umbrella. The study, another co-authored by Kulshreshtha, found the pastures offered $13.3 million in annual economic, environmental and social benefits, in a province where 99.9 per cent of native grassland no longer remains (Gunn, Kulshreshtha, & Roy, 2018). 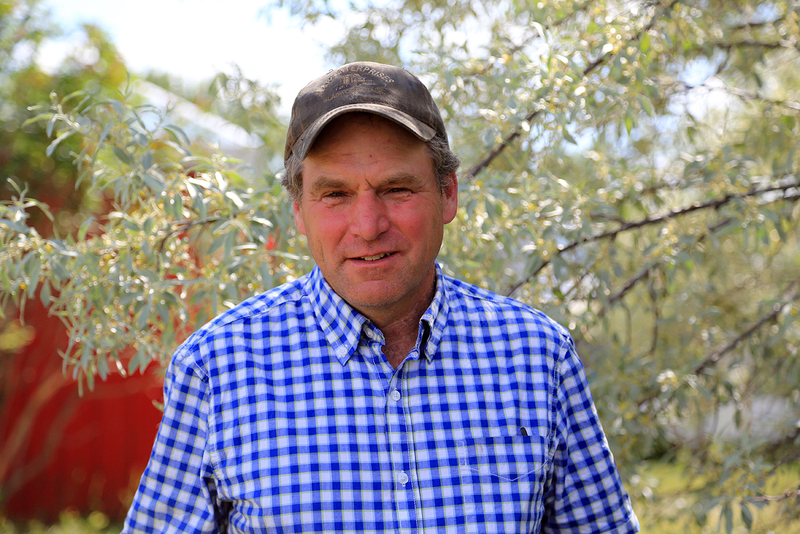 Ian McCreary, a farmer from Bladworth, Saskatchewan, discusses CPPAS and why the pasture his community is now responsible for needs long-term government investment. Meanwhile, the Saskatchewan government stuck to 15-year Crown lease agreements with individual patron groups who were able to incorporate as grazing businesses, and as supplied no funding support for the Community Pastures Patrons Association of Saskatchewan. While the patrons didn’t have to buy existing infrastructure on their pastures like fences, dugouts corrals, wells or yard sites, they are responsible for all improvements and replacement materials. As well, the administrative burden is heavy. The leaseholders are expected to annually submit a maintenance report, a grazing report, invasive species report, livestock grazing allocations and a schedule of their maintenance repairs. The patrons must also allow access to First Nations hunters from November to March, which takes further oversight. For McCreary, the work leaseholders are doing for the public good is not taken into account in the lease agreements. Wally Hoehn, director of the lands branch with the Ministry of Agriculture, doesn’t think the lease policy with the former PF patrons is more onerous. He said it’s similar to the leases the ministry has with 135 grazing co-ops across the province. “I don’t know if they have more responsibilities, I’d say that have different responsibilities,” said Hoehn. When asked if he thought the ministry was now requiring patrons to shoulder the public good, Hoehn said the ministry is merely continuing the oversight that existed under the federal system with its reporting requirements. The fact that that oversight now lands in the laps of those the system served, was not addressed. “We aren’t holding these groups to any higher standard than what we would hold our other lesees to, to actively manage it, be a good steward of it,” he said. Wally Hoehn, with Saskatchewan's Ministry of Agriculture, comments on the current leases with the former PF pastures and Manitoba's AMCP model compared to the Saskatchewan approach. Rick Ashton, former co-director of the PF pasture divestment, discusses the Saskatchewan government's current lease policy for the former PF pastures. 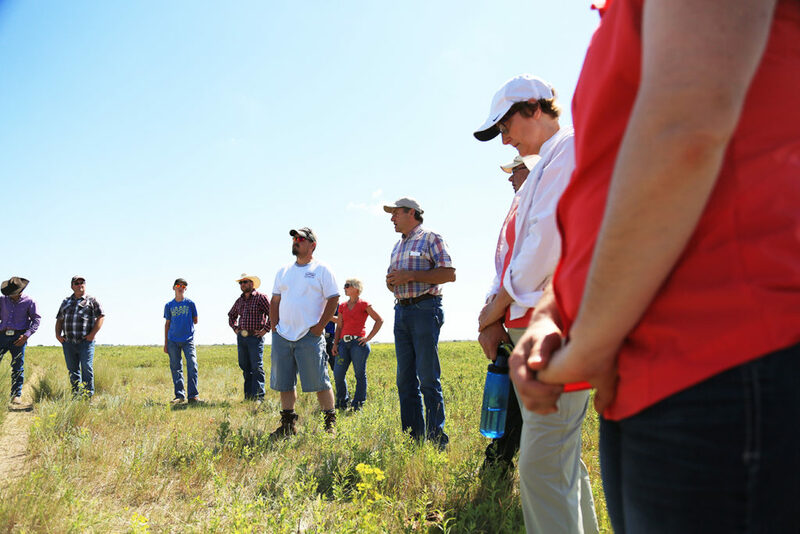 Jennifer McKillop, director of conservation for Nature of Conservancy of Canada - Saskatchewan Region, discusses the benefits of NCC's partnership with five former PF pastures and how Saskatchewan lags behind national and international conservation targets. McCreary knew other pastures weren’t so lucky when it came to hiring their former pasture manager. CPPAS worked with Nature Conservancy of Canada to set up a pilot grant program that helps patrons with the costs of ecological monitoring, formerly a federal government responsibility. Successful pasture applicants receive $25,000 to help pay their pasture manager’s salary and keep up the grassland management like it was under the PFRA system. For Jennifer McKillop, the senior director of conservation for NCC Saskatchewan, the grant program has provided opportunity to build relationships with producers. So far the Conservancy is assisting five former federal pastures through it’s pilot grant program, which also offers range-health assessments and advice for how to best deal with species at risk. McKillop says NCC Saskatchewan and Manitoba are compiling their information and the hope is to establish an inventory of conservation priority areas in the former federal pastures and in the provincial pastures. The group has also turned its attention toward former provincial pastures, which the Saskatchewan government began divesting control of in 2018. While it looks like NCC is providing the resources to protect the public’s grasslands, the provincial government made a recent move in its 2018-2019 budget, assigning six (five positions are currently hired) rangeland specialists to be available to the patron-run grazing associations to help with range-health assessments. Hoehn says he knows they need more than six but that it’s early days. Ashton reports that in some places the board of patrons is at best a “fragile coalition” and estimates that 30 per cent of patrons aren’t maintaining the grassland the way it needs to be kept. Back at Barney’s Corrals, a circle of men sit in camping chairs set up between a pick-up and a Volkswagon, an attempt at some privacy after the pasture tour. A combination of baseball caps and cowboy hats, they sit with their arms crossed, deliberating decisions about staff. I hear Ian McCreary’s voice often, suggesting what the next course of action will be and joining in the laughter when it’s clear that no one has looked at the budget yet even though the AGM is tomorrow. Although trying to maintain the grassland in the Wilner-Elbow pasture has been a frustrating journey for him and the pasture board, McCreary has seen a positive outcome. According to McCreary, over the past six years, quitting was never an option. “It’s the same as to get the crop in the ground, getting it off even if it snows for a month. It’s still what your folks done, you just got to get her done,” he said.